Everyone's had a couple of tablespoons of cream cheese left after having bagels or those crumbs at the bottom of the bag of potato chip. Why not use them to make delightful and varied fillings for what is often viewed as a fancy appetizer? It's what I do when presented with all those little things and I couldn't be more thrilled. Not a fan of mushrooms? You can also stuff peppers (I really love those little sweet ones you can find in multiple colors), tomatoes (be careful — they soften up a lot), and even onions (use a melon baller to remove enough of the core to fill and bake). In the end, it's about putting together a tasty filling with just a few ingredients and baking it inside of something else you find delicious. Worried about screwing up? What do you have to lose? How many of those ingredients were going to end up in the trash anyway? So look at it this way: if you make an amazing filling, you've saved the day. If you end up with a dud, you've just prolonged the life of a few items that weren't likely to be used anyway. And you've likely learned at least a few things along the way. I'm gonna call that a success either way, although I wish you delicious success, all the same! 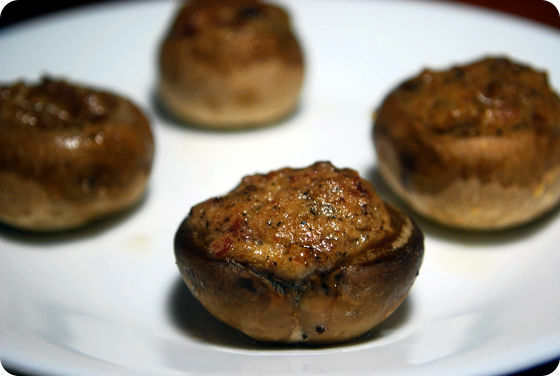 Preheat the oven to 350° F. Finely chop the stems from the mushrooms. In a skillet over medium-high heat, add the olive oil or cooking fat of your choice and stir-fry the chopped mushroom stems until softened and lightly browned. If desired add the seasonings of your choice. Arrange the mushroom caps, cavities facing upward, in a baking dish. This is by no means an exhaustive list. It's offered as a bit of a guide and illustration of just how varied the fillings for stuffed mushrooms can be. I've made fillings from 2 slices of bacon that have been fried and crumbled, cream cheese, and some crushed crackers. I've had equally delicious fillings consisting of a bit of mayo, some sun-dried tomato bits, and sliced green onions. You get the idea. Bake in the preheated oven for 15-20 minutes or until the mushrooms are soft and the filling is set. Allow to rest for 5 minutes before serving.